Goldman Sachs: a Hedge Fund Managed by Traders? DUBAI--I spent a good deal of the night watching with absolute disbelief the "dialogue" between the Senate Committee and Goldman Sachs leaders. There was a clear disconnect between the members of the committee and the Goldman Sachs management. Congress thought they were questioning the leaders of an investment bank about their fiduciary duty vis-à-vis their clients. What became completely obvious for all the world to see is that Goldman Sachs is a hedge fund dressed up like a client business and that they are absolutely not interested in clients except to use them as screen for their own proprietary trading activities. As a hedge fund, Goldman Sachs is just a group of astute risk managers, brilliant market strategists who managed during the crisis to weather the storm. Their claim that they were not "directional" in their proprietary or principal business was absolutely disingenuous. Even in their origination business, the firm's interest went first. Lloyd Blankfein is a trader: he does not really know what is in his balance sheet, cannot articulate one sentence to express an idea and is totally unaware of the way his firm dealt with rating agencies. When Senators were asking them questions about "selling" assets and "shorting" Lloyd did not even realize that what they had in mind is the primary sale of new issues. That is why he did not answer the basic question: "does Goldman Sachs have any sense of the need to disclose that they purposely created instruments that collapsed after a few months and sold to their clients with the sole intention to short them?" Clients at Goldman Sachs are clearly not a priority: they do not even believe they should share their positions on the securities they sell, package and underwrite. The hearings on the rating agencies clearly indicated that they were using credit agencies models passed on to them by the agencies. Even origination was proprietary. Goldman's disregard for clients is represented by outrageous emails that the CFO had to be pushed to admit that they were "unfortunate." It is totally impossible to distinguish in the accounts of Goldman Sachs what is proprietary and what is client business. Based on a discreet inquiry, I came to the conclusion that the vast majority (some believe up to 80%) of Goldman Sachs businesses are for their own accounts. Let's be honest -- Goldman Sachs is a hedge fund. They should not be granted the right to become a bank holding company and access the window of the Federal Reserve. Their refusal to address ethical or simple common sense questions, or provide clear answers as to the importance of their client business is paramount. I compared that deposition with the testimony of hedge funds a few months ago: same vocabulary, same attempt to make believe that they "follow" the markets. One does not intend to provide $ 24 billion of bonuses on agency businesses. It comes from somewhere. In the discussion about "too big to fail," it became obvious that investment banks should be split between their trading agency and their principal business. Doing this would provide clarity to those naïve clients who would know that if they deal with Goldman Sachs they trade with a hedge fund. If this split were to happen all fiduciary illusions would be gone and investment banking cynicism would begin to die down. Plus the trading and principal side would be allowed to go bust at the next crisis while the real investment banking side would be protected. Yesterday's demonstration was luminous. 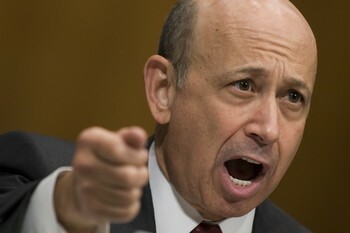 Goldman Sachs is a hedge fund managed by traders. Don't bank with or on them.